No other organisms in the world behave like this. Finding relationships between living things isn’t rare. Basic science teaches us that species of various shapes and sizes often find themselves in some form of mutually beneficial relationships or symbiosis. They are fairly common among invertebrates (organisms without a vertebral column or backbone) as well as algae, like the relationship between corals and mollusks. In 2011, however, scientists found a rather unique relationship between a particularly type of algae and the salamander. It was discovered that a species of spotted salamander known as Ambystoma maculatum formed an intimate relationship with an alga, Oophila amblystomatis. How intimate? The alga was able to put itself inside the envelope surrounding the salamander’s eggs, where it then lived. Scientists have observed this algae inside salamander eggs for well over a century, but its presence has baffled them. It was only in 2011 when researchers from the U.S. and Canada realized that this relationship wasn’t exactly a textbook case of symbiosis. The algae was found to also grow inside — not just outside — the cells of the developing salamanders. This makes it the first known example of an endosymbiosis, previously thought to occur only between non-vertebrate animals. It’s also believed to be the mechanism that led to the growth of eukaryotic cells (cells with nucleus and organelles contained in a membrane) from prokaryotic organisms. A recent study published in the journal eLife was finally able to analyze just what this endosymbiosis between the salamander and the algae consists of. The researchers from the American Museum of Natural History in New York and Gettysburg College in Pennsylvania studied and compared the transcribed messenger RNA codes from the algae genes that had latched on outside the salamander eggs, as well as those growing inside. As for the salamander eggs, the existence of algae inside and outside didn’t cause it any harm. It seems able to let its immune system ignore the little guests. 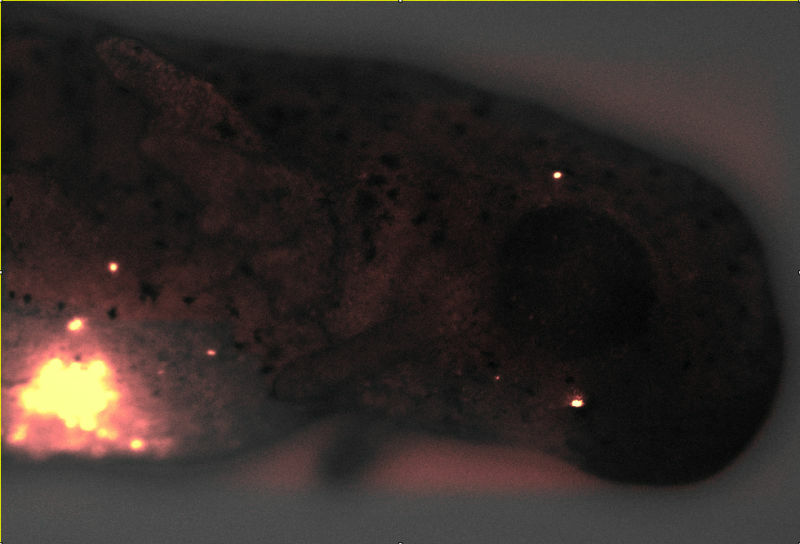 That being said, it didn’t appear that the setup was entirely beneficial for the eggs: “We may speculate that intracellular algae are providing some benefit to its host, as many past light/dark rearing experiments have shown a net benefit to the salamander embryo from their algal symbionts, which presumably included endosymbionts as well,” the researchers wrote. So, why did this algae even bother getting inside the eggs in the first place? For now, scientists could only speculate. One thing is for sure, though: this discovery shines a new light in our understanding of endosymbiotic relationships. Further studies could help uncover more about this strange phenomenon, and perhaps help us understand more about how complex cellular life emerged from an endosymbiotic relationship between unicellular organisms from our biological past.